Saturday was spent in the company of a bunch of good people riding bikes and drinking (home brewed) beer. It was the second annual Bootleggers Bliss organized by Steve over at the world famous Wrench In The Gears blog. It goes down like this: brew up a batch of beer to share (or help a friend do it), bring some food to share, grab your bike too (that's important) and show up with the right attitude. Namely, prepare to have fun and share your stuff with like minded people. This year's venue was the dirt roller coaster known as Rosaryville State Park. 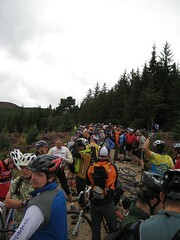 Somewhere between 15 and 20 people showed up ready to sample the tasty adult malt beverages and tear into the buff singletrack. Despite a reasonably warm forecast, the day started chilly and people were rooting around for an extra layer to ward off the wind at the start. 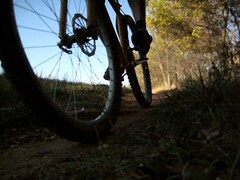 As the cloud cover burned off it turned to a sunny and mild day, perfect for buzzing the leafy singletrack. We rolled as one large posse, stopping occasionally to regroup, play on stunts and log piles, photograph our goofiness and heckle each others skills (or lack thereof). When the riding wrapped up it was on to good food and good beer. Not sure that I can pick a favorite brew, there were a lot of good things to choose from and I tried to sample them all. Plenty of hoppy ales were on hand. I personally brought a double IPA and a Pale Ale. 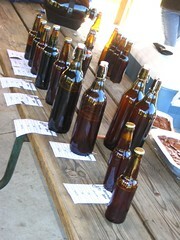 A few more IPA's were on hand, a Belgian tripple, fancy porters and stouts just to name a few of the styles. Beer drinking leads to shenanigans on the bikes naturally so first up was some "picnic table trials" where a few of us tried to hurt ourselves. This was followed by a few rounds in the derby pit where a few bikes and people were injured all in the name of good, stupid fun. The casualties included at least 3 taco-ed wheels, one of which was mine. That will teach me to try out a "race" weight rim. Ricky d, you've got a target on your back, better watch it! After we ran out of functional bikes we returned to drinking before wrapping up near sunset. Just another great Saturday to deposit in the bike bank. Rosaryville State Park: as mentioned above, a dirt roller coaster; fast and twisty, elevation changes similar to Schaeffer; a few technical specific sections including a big horseshoe log ride. Got out of work early and swung by Schaeffer on the way home in time to catch a nice sunset autumn ride before the turning back of the clocks. Out of the gate pushed a good pace without getting full bore, wanted to get a feel for what the bike felt like underneath me. The dirt is bone dry right now but the leaves have been falling so I was curios to see how the bike handled when I leaned into the turns. Felt solid with no hint of wash out on either end so I upped the pace. Still good, no sketchiness, felt like my weight was evenly distributed between both wheels. After a short bit I felt like I was right at home and proceeded as if I was on a familiar steed, comfortable enough to cross it up and kick it out on dirt piles I was coming across and launching off of. The bike responded to input nicely, no surprises, no strange handling. When I was done I felt like "this bike rides pretty nice". When a bike is poorly designed, it's easy to put your finger on it but when it does what it is supposed to do and handles good it's easier to take it for granted and harder to nail down exactly what you like about it. I came away from the first ride feeling like I could put my finger on one big thing: balance and weight distribution of the rider felt really good. Rosaryville's similar terrain confirmed the first rides impressions. Leaning into corners felt good with no sketchiness. Granted, I haven't pushed it over the line yet where I get into that stupid high speed "are my tires going to hold/is my heath insurance paid up" scenario, I'm waiting to I swap out the front tire I've been playing with for the aggressive Nevegal stand by before doing that. Still, I was hitting things with plenty of speed and got to add the slow moving tech log riding with big turns into the equation coupled with some goofing off on other weird log rides and the earlier mentioned picnic table trials. All in all the bike felt good. A little heavier than the Kelly and I could feel it when pulling a few moves, but that's no surprise and at the price, can't really be flagged heavily. After Saturday's derby disaster I spent the evening doing some aggressive wheel truing to get the rear wheel usable and allow it to spin between the chainstays. Turned out pretty well with a small hop still in it but it will do for now. Luckily there is a spare rim with the same ERD hanging on the wall so I can do a rim swap when I have time. With the wheel back in action I headed to Gambrill on Sunday for some testing on the rocks. The ride starts with a bunch of climbing with loose rocks, a few water bars and long stetches of technical rock gardens. The Jabberwocky handle things nicely, no complaint when climbing in or out of the saddle. Once on top and starting to descend I noticed the rear brake was mushy. A few pumps to the lever made it work, but this technic only last about 3 times before complete brake failure. Hmmm, looks like the hydro line got tweaked when I got tangled up with DT in the derby. Oh well, the show must go on, time to really see home well the bike handles the rock descents with a front brake and a freewheel. Normally I run a mullet (disc front, v-brake rear) so I've got a fixed/free option that solves problems just like this. However, this frame is disc only so I didn't have that option during the build. And to think, I was just going to grab a fixed wheel last night since the other one got knackered. Too late for regrets. The fact is, most of your braking power comes from the front end and you should be using your front brake more than the rear anyway. The bike handles the rocks and technical stuff just fine and I only had to slow down a touch on the steepest rock descents, purely because of the lack of a rear brake. Otherwise I just rolled as normal and the bike happily did what I told it, no surprises and no misbehaving. So, there you have it, a few first impressions on the Jabberwocky. With only a few rides on it I like it. Look for the short term review down the road, complete with more in depth ride impressions as well as all the nerdy details like weights and measures. Meet at the lower parking lot on Gambrill Park Road at 9am. Overflow parking at the upper lots. Bring gloves, water, snacks, etc. We'll have tools but feel free to bring your own too, we can never have too many. Directions can be found here. As always, thanks for helping keep the trails in good shape.